The e-STUDIO2508A/3008A/3508A/4508A/5008A comprises an A3/LD-size monochrome MFP series that offers print speeds of 20/25/30/35/45/50ppm. The series is designed to put a fast, efficient, secure MFP in the hands of small and medium workgroups. Not only is it high-volume, it also produces high-quality type and images. Toshiba Tec included its new MFP systems called e-BRIDGE Next in the e-STUDIO5008A series to present users with more flexibility while adapting to their unique workflows. The new touch screen user interface allows for easy customization to address user’s preferences and needs, which can focus on vertical markets and simplify the workflow. The embedded application platform makes it possible to easily integrate solution application into the e-STUDIO5008A series. A powerful multi-core processor enables users to produce complex documents without having to compromise on quality. Toshiba’s outstanding DSDF* is capable of handling a maximum of 300 sheets and allows for double-sided colour scanning at speeds of up to 240 images per minute. The high-speed data processing and output save time while increasing business efficiencies. Today, many Cloud & Mobility solutions are provided and these are absolutely imperative for business. The e-STUDIO5008A series further simplifies cloud and mobile printing and capturing enabling users to work anywhere they prefer. 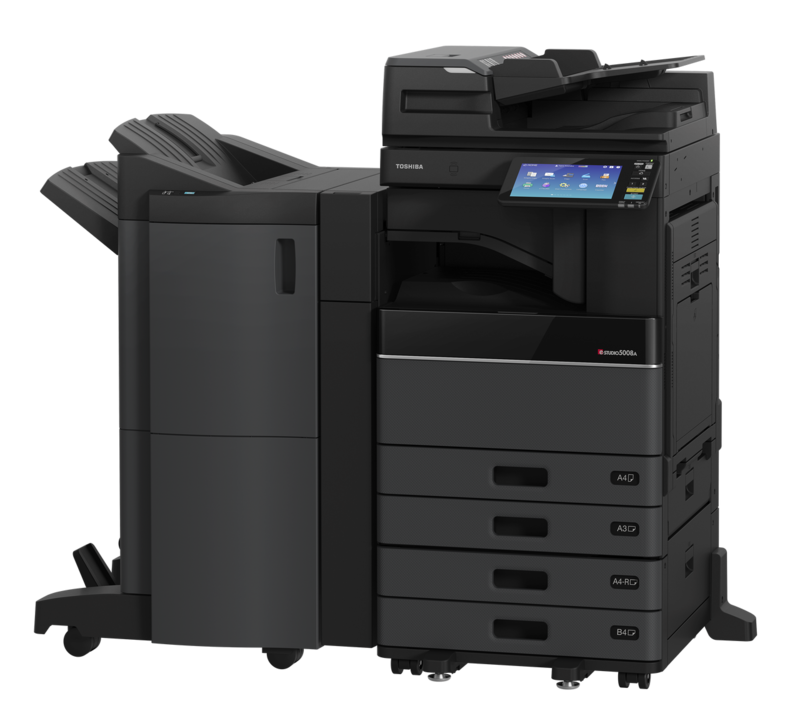 The stylish and compact new look complements most contemporary business settings, and the modern sophisticated black colour and texture symbolize the next generation of MFPs. Furthermore, the new Toshiba MFP series’ more durable and reliable engine will maximize uptime and reduce cost of ownership. MFPs are subject to increasing demand to safeguard data, amid growing concerns over information security. The e-STUDIO507 series is compatible with a variety of communication protocols used to protect information security. The series achieves advanced security without sacrificing ease of use, thorough self-encryption HDD, user authentication and access control. Other powerful security features include the retention of access logs, and generation of encrypted PDF. The e-STUDIO5008A series meet the criteria of major environmental programs and standards, such as EPEAT®’s Gold, the international ENERGY STAR® program and the Blue Angel mark. In addition, these MFPs are certified as Toshiba’s “Excellent ECPs (Environmentally Conscious Products)”. Excellent ECPs is Toshiba group’s internal certification awarded only to the products achieving the highest level of environmental performance in the industry.